Game shooting forms an important part of Brudenell Estates. Deene Park shoot is well established as a result of the leadership and dedication of Robert Brudenell and his Head Keeper, Gavin Chambers. They have developed the shoot into an exciting offering with a range of drives to suit all abilities. The Game Keepers have worked hard to; develop new drives, improve the cover crops and release pens. We are pleased to say this enables us to show some challenging birds. We were pleased to welcome Mike Barnes, the Editor at Large for the Fieldsports Magazine to Deene Park. His article about the shoot here at Deene Park can be read in the October/November 2017 issue. For those of you that have not read Fieldsports Magazine, it is a first class publication covering a wide range of sporting topics, with some well respected contributors. 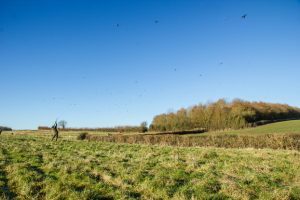 Deene Park is becoming well known as one of Northamptonshire’s leading partridge shoots, providing challenging shooting amidst a well-managed landscape. There are ten drives specifically designed for partridges. Pheasant shooting at Deene Park continues to be a very traditional experience, providing good quality sport in open farmland or within mixed woodlands. There are nine drives specifically designed for pheasants. Deene Park prides itself on its hospitality. The shoot day starts with a welcome and coffee in the old tea rooms. Lunch is provided by our own chef and again is served in the Old Kitchen Tea Room. We offer a wonderful menu of locally sourced food, with a choice of ten main courses. Predominately we host 200 bird days, however larger days can be catered for to suit your requirements. Bookings are now being taken for the 2019/2020 shooting season. For enquiries regarding the Shoot, please contact Head Gamekeeper, Gavin Chambers at gavin.chambers@deenepark.com or Robert Brudenell, at robert.brudenell@deenepark.com. Our recommended accommodation partner is The Talbot Hotel in Oundle. For group bookings of 8 or more rooms, the hotel offers preferential rates for one and two-night stays. These rates include; Bed and Breakfast on the first night, 3-course Dinner, Bed and Breakfast on the second night. Or 3-course Dinner, Bed and Breakfast for a one-night stay. The Talbot Hotel and Eatery is an AA rated 3 star hotel, with individually designed bedrooms including several feature rooms. It is an historic former 17th-century coaching inn located in the centre of Oundle. To take advantage of this offer, please visit The Talbot website, pick your dates and number of rooms, then add the code DEENE_SHOOT to the offer code box at checkout. Alternatively, call The Talbot Hotel on 01832 273621. Guns can be cleaned upon request. Please speak to the shoot team upon arrival or contact Head Gamekeeper Gavin in advance of your visit on 07786 554727 for details of this service. We work closely with Simpson Brothers, our local Gunshop. Simpson Brothers Gunshop are available for any requirements our guests may have for the day, offering a friendly and helpful service. Marcus can be contacted on 01832 226 376. Robert Brudenell is one of the great supporters of game shooting. He firmly believes that it is important for this historical way of life to be maintained. Robert believes the shoot greatly improves biodiversity across the Estate, as well as generating employment and supporting the rural economy.